Marble Is The New Granite! - G.C. Smith & Co.
Marble is now making its comeback in the world of modern interior design. This versatile material is renowned for its striking appearance and the fact that no two pieces of marble will ever be the same. No more is marble seen as a cold stone that is far from sleek. Instead, marble is currently one of the hottest trends in interior design that many people are lusting after. Our secret to making marble pop in your home is to use it for statement pieces. Less is more when using marble and it should be used sparingly so it doesn’t overwhelm the eye. Marble is far from being a new material. Many Ancient civilizations used it and even the Ancient Greeks built their beautiful structures with it. Marble is in fact a natural stone that is million of years old and is a nonfoliated metamorphic rock. Marble comes in a variety of colours and is a softer stone compared to granite. It’s a luxurious eco-friendly material that can add elegance to any home. Marble is a strong material that is long lasting, making it a great material to use for furniture. A statement furniture piece can add luxury and class to a room. 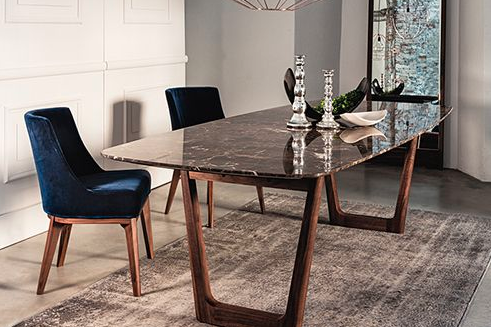 Marble dining tables and tabletops are very popular at the moment. They can add light to a smaller space whilst also showcasing of a minimalistic aesthetic. Pair it with gold or bronze accents to add a luxe-deco feel to any room. When most people think marble, they think bathroom. By far marble is most commonly used in bathrooms as the texture screams luxury. Not only is it aesthetically pleasing but very practical. Marble has a natural cooling effect, which is perfect for a bathroom as the temperature is often raised from showers and hot hair tools. Also, the natural marble tone can make a bathroom look more spacious while also creating a calm atmosphere in the room. The easy maintenance is also another great aspect of using marble in your bathroom. A soft cloth and a mild soap solution can easily clean the surface of the stone. To add a contemporary twist to your marble bathroom, pair it with gun-metals. This will create a tough-luxe interior that your friends will be complimenting you on. If you want to enhance the aesthetic appeal of your home with marble, G.C Smith & Co offer a stunning variety of marble solutions. Visit our showroom to view samples of the options we offer.